"Sansho The Bailiff" (aka "Sansho Dayu") traces an epic journey-over land and sea, through space and time. Actually, in "Sansho"'s case, several quests are intertwined, and each rhymes off the others to create a harmonic wholeness that is Kenji Mizoguchi's hallmark as a director. The quest of a brother and sister for their mother; of a slave for freedom; of a boy for this father and the principles for which his father stood (or of a boy to become the man his father became); and the quest of a stream for the sea-all are equally significant journeys for Mizoguchi. Some of the director's other films have titles like "The Story Of The Last Chrysanthemums" (1939) and "Tales Of The Pale And Silvery Moon After The Rain" ("Ugetsu," 1953); "Sansho Dayu" could be called "Tales Of The Seaweed Harvester After The Tidal Wave," or perhaps "Tales Of The Ripples On The Water." More than a narrative of epic history and family history, the story of an individual and a generation, it is also a tale of memories and landscapes; or of memories AS landscapes (and vice-versa). Kenji Mizoguchi (1898-1956) was the son of a poor carpenter. His mother died when he was 17 and his elder sister was sold as a geisha. Mizoguchi worked in a hospital, as a newspaper ad illustrator, and as an actor before making his first film in 1922 at the age of 24. He went on to make 86 more. A fragile man afflicted with chronic rheumatism, Mizoguchi died of leukemia at the peak of his popularity when he was 58. Perhaps partially because of his early losses, virtually no other director, with the possible exception of Max Ophuls ("The Earrings of Madame de...," "Letter From An Unknown Woman," "Lola Montes"), with whom Mizoguchi also shares certain stylistic affinities, has created a body of work which displays such profound empathy with women. Mizoguchi's heroines are often prostitutes who, though physically delicate, endure superhuman sufferings and degradations only to emerge with their bodies broken but their souls intact and indomitable. Andrew Sarris describes the ending of one of Mizoguchi's many masterpieces, "The Life Of Oharu" (1952): "In the last frames of the film, Oharu pauses, turns to look at a distant pagoda, her spatial and spiritual correlative, and passes off the screen while the pagoda remains." That image of the transience -- and enduring continuity -- of human existence is, like the final images of "Ugetsu" and "Sansho," the stuff of which Mizoguchi's art is made. "Sansho"'s first image is of ancient stones embedded in the ground. The film's story is similarly rooted deep in the traditions and memories of the Japanese. These megalithic monuments, like stone breasts pushing up out of the earth, are powerful, mystical reminders of ancient lives, traditions, and the continuity of time itself. They first carry us back in time to begin the story (with the journey already underway), and Mizoguchi later re-introduces them to propel the narrative forward 10 years. "Sansho"'s opening title, superimposed over the stones, proclaims: "The origin of this legend of Sansho Dayu, the Bailiff, goes back to medieval times when Japan had not yet emerged from the Dark Ages and mankind had yet to awaken as human beings. It has been told by the people for centuries and is treasured today as one of the epic folk tales of our history." Japanese period films, or jidai-geki, often draw on familiar myths and legends for their storylines. "Chushingura," or "The Tale Of The Loyal Forty-Seven Ronin," has been filmed innumerable times-by Tatsuo Osone, Hiroshi Inagaki, Mizoguchi, and many, many others. Although Mizoguchi made quite a few films with contemporary settings, known as gendai-geki, most of his films that I have seen have been set in the distant past. By setting his films in a historical/legendary past, Mizoguchi achieves a fable-like timelessness. Mizoguchi's visual style is also based on Japanese tradition. He stresses diagonal compositions like those found in prints by well-known artists such as the 18th-Century Utamaro, who also specialized in portraits of women and about whom Mizoguchi made a film in 1946. Visual energy flows through Mizoguchi's frame on the diagonal, suggesting a world much larger than, and never contained by, that frame. The lines of the tree and the brook, which the characters follow in Sansho's opening shot, suggest we are seeing only a portion of a journey-in-progress, a journey which began somewhere (and sometime) offscreen-left and will continue to destinations unknown offscreen-right. Mizoguchi's films don't posit absolute beginnings and endings for themselves; human life is a journey which has no beginning or end -- it keeps flowing, metamorphosing, interacting with the world at large. 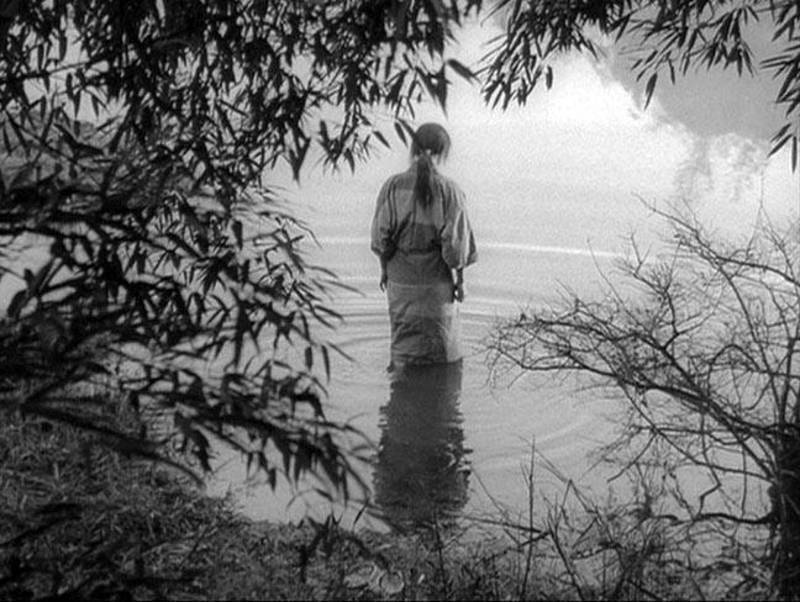 Water (streams, lakes, oceans), fire (flames, smoke), and earth (rocks, trees, hills, paths, roads) achieve harmony in, and through, Mizoguchi's compositions; they, too, are "characters" in his elemental dramas. As one Japanese critic has suggested, the setting is the real hero of a Mizoguchi film. The landscape often determines the shape of the story, or vice versa. Mizoguchi frequently uses long takes, and long-shots, which emphasize his characters' position in, and relation to, an environment. But unlike, say, Fritz Lang or Stanley Kubrick, Mizoguchi does not imprison his characters in his landscapes/compositions/shots; he stresses both their harmony with the landscape and their transitory nature as they move through timeless natural settings. Yet even these age-old vistas are not immutable; they are constantly evolving. The last image of "Sansho the Bailiff" is of a landscape whose character has recently been altered by a tidal wave. When Mizoguchi shows us a stone, a tree, a river, a hill, a road, we wonder how many centuries it has been there, what it has survived, and what forces have shaped its evolution throughout the past. Mizoguchi lets the scenery tell the story whenever possible. Though his actors may plunge into what Western audiences might consider melodramatic histrionics, Mizoguchi, with characteristic reserve, pulls his camera back rather than moving in for a close-up. Often the setting speaks much more eloquently than the characters could: the fields of waving, tufted weeds through which the lost travelers wander; the terrifying white space that opens between Tamaki and her children as they are separated on the placid shores of a lake; the union of ocean and beach, mother and son, in the final shot. Like Ophuls, Mizoguchi is a master of the moving camera, especially the crane shot. I mentioned the influence of Japanese prints on Mizoguchi's compositions; many Western artists, including the Impressionists and especially Vincent Van Gogh, admired the flattened perspectives of these prints. Mizoguchi, with his ever-changing perspective and depth-of-field, creates protean Japanese prints in "3-D." Not only does visual energy flow from left to right, but from background to foreground as well, as in the opening shot previously mentioned. Memory, for Mizoguchi, is the triumph of the human spirit over time and space, and "Sansho" is alive with reverberating memories. To begin with, the tale of Sansho the Bailiff itself has been, we are told, memorized and passed down for countless generations. In Mizoguchi's film, objects, gestures, settings, songs, and movements become bridges through time. Early in the film, we move back and forth between Tamaki, Zushio, and Anju and memories of the children's father: a dissolve telescopes time so that Zushio, running away the camera, is transformed into a child; Tamaki, drinking from a cup, remembers her husband performing a similar action and we later see Zushio repeat his father's movements. Perhaps the most powerful memory-image in the film is an overhead shot of Zushio and Anju working together to break off a tree branch which they will use to build a shelter for the night. Zushio has been taught by his father to remember several basic principles, which are concretized in the heirloom image of the Goddess of Mercy he carries with him at all times. After having grown up under the tyranny of the Bailiff Sansho, Zushio appears to have forgotten these principles until Mizoguchi reprises the earlier camera set-up (reminiscent of the repeated shot down the stairs in Ophuls' "Letter From An Unknown Woman") as brother and sister again pull down a tree branch -- this time to shelter a dying woman, their surrogate mother at the slave camp. (The woman, Namiji, is branded by Sansho when she attempts to escape because Zushio and Anju "reminded me of my own children back home.") The motion of breaking the branch and falling to the ground is all it takes to recall to Zushio the humane ideals he has forgotten, and it also reminds Anju, who suddenly hears their mother's song, that Zushio will need her help if their family is ever to be reunited. Cutting through space and time, Mizoguchi rhymes Zushio's act of mutilation with his mother's escape attempt and the cutting of her Achilles tendon. In a moment that recalls the famous tennis-match shot in Hitchcock's "Strangers on a Train" (1951), the other courtesans turn away in horror from Tamaki's agony while her "boss," her Sansho, looks on unflinchingly, unfeelingly -- a reminder, too, of Namiji's branding. Zushio is given a new name, Mutsu, after his birthplace (a place, not an ancestor). In assuming this new name he denies, or at least subordinates, his true identity, the name his father gave him, but his new name is given him by a man who, though Sansho's son, is spiritually also a son of Zushio's own father. After Zushio's reawakening, Taro becomes a kind of surrogate father offering protection and shelter, and Zushio leaves "mother"/Namiji in Taro's care. Before he can reunite his family, Zushio must accede to his father's former title and relinquish it over a matter of principle as his father did -- this time by freeing Sansho's slaves, even though he has no legal authority to do so. "Reconsider your limitations," Zushio is counseled. But Zushio must choose his father's words, and his own principles, over the letter of the law, and must then be prepared to make the necessary sacrifices. In "Sansho"'s remarkable opening shot, Mizoguchi divides the frame into a yin and yang of sunlight and shadow. Critic Robin Wood has invoked this Oriental idea of light and dark, active and passive forces which together create a whole, to discuss "Sansho"'s water and fire imagery. Fire is often associated with action, anger and destruction, and is almost always "male": the torches of Sansho's search party, the branding-iron fire, the destruction of Sansho's estate. On the other hand, fire also cooks food and keeps the wolves away. Water is a life force flowing throughout the film, primarily associated with the never-ending journey of life, with natural passivity, with women, and especially with Mother. But water also separates Zushio and Anju from Tamaki. It seems unfair to even try to talk about the rich and resonant water images in "Sansho" because the images themselves are so potent they cannot be reduced to linear, language-based concepts of "meaning." Nevertheless: water drips from a tree-trunk (and is echoed with liquid purity in the soundtrack music) as Namiji lies, her life ebbing away, in a graveyard. Anju gives her an umbilical tendril to cling to, which is attached to a stone image "responsive to prayers." Namiji is to be left here to become part of this landscape, her body decomposing into the soil with the living, water-carrying roots and vines, the cold rocks, and the bones of those who have preceded her. The dripping begins only when Zushio reclaims her from this grave. In the separation/kidnapping scene on the lake, the children's nurse, another surrogate mother, is drowned fighting to rejoin the children. Her death is recalled in Anju's suicide, one of the most beautiful and poetic (specifically haiku-like) moments in all of cinema. Anju descends slowly, gracefully, and resolutely into the water, sinking into her reflection until she is swallowed up. Concentric ripples on the otherwise smooth surface of the water spread throughout the frame. Cut to a haloed image of a Buddha. Anju is assimilated into the land- and water-scape; the ripples of her life and death continue to spread, her sacrifice making possible Zushio's (and Namiji's) escape and salvation. Her death fulfills her greatest desire in life. Anju leaves behind her an open gate, as did her father: in death, she does not entirely cut herself off from the world of this transient life. On the contrary, she passes through that portal into another life, and her immersion in water is seen as a spiritual/mystical reunion with her mother, a return to the womb, a rebirth. Mother's song ("Anju, Zushio, how I long for you,") reverberates over the ripples on the water. When Zushio arrives as Sado in search of his mother, he is told that she has either jumped from the cape into the ocean (presumably from the spot where we have seen her sing her song of longing) or was engulfed by a recent tidal wave along with many others. Zushio's quest culminates at the shores of the great sea, where all rivers eventually lead. "You have followed the natural course" -- his father's path -- and it has led him to manhood and to reunion with his family. Mizoguchi's camera rises from this intensely, almost unbearably emotional scene to gaze out past mother and son at the now-tranquil sea. One senses in the deep waters which fill the horizon the presence of the entire family in the same frame-space -- Anju, Father, the nurse. The camera turns, peering down at the tiny figure of the man harvesting seaweed on the vast beach. In the aftermath of the tidal wave, out of that oceanic graveyard which envelops most of the earth, he gathers the food, and fertilizer, necessary for those who carry on in "this transient life." Originally published in April, 1983.